To register for Dr. Wolfelt’s Professional Seminar, please click here. 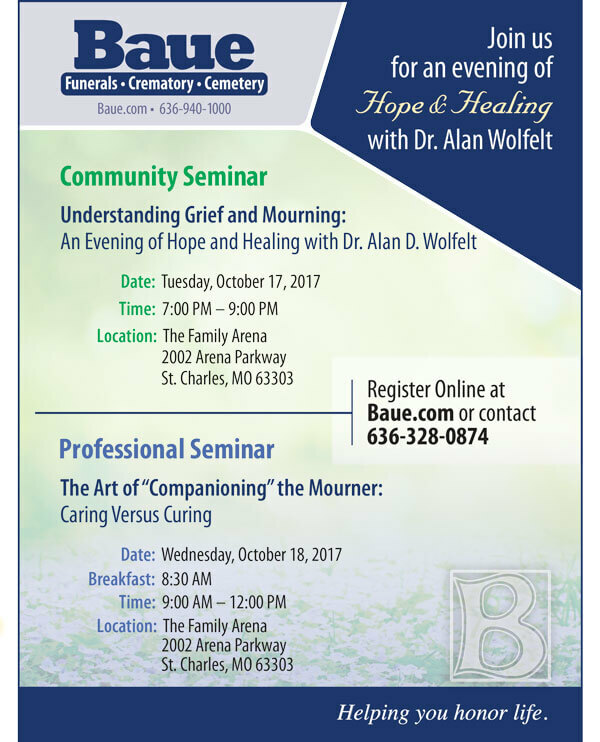 On Wednesday, October 18th, 2016, caregivers have the opportunity to hear nationally renowned bereavement counselor, Dr. Alan D. Wolfelt address on “The Art of “Companioning” the Mourner: Caring Versus Curing” From 8:30am-12:00pm at The Family Arena. In this informative seminar hosted by Baue Funeral Homes, Dr. Alan Wolfelt will help participants enhance their understanding of “complicated” mourning. Special focus will be placed on learning a comprehensive assessment model related to factors that naturally influence complications of grief and mourning. Come join us and learn more about this important topic. This professional seminar is $20, participants will receive a certificate for 3 CEU credits. In honor of Hospice and Clergy Appreciation Month, this seminar is complimentary for hospice and clergy professionals. Click here to register. The evening of Tuesday, October 17th, Baue Funeral Homes is hosting a complimentary seminar for the community and grieving families. Dr. Wolfelt will discuss “Exploring Death, Grief, and Mourning” For information, please click here. Dr. Alan D. Wolfelt is a noted author, educator, and grief counselor. Recipient of the Association for Death Education and Counseling’s Death Educator Award, he serves as the Director of the Center for Loss and Life Transition (www.centerforloss.com), in Fort Collins, Colorado. He is also a faculty member of the University of Colorado Medical School’s Department of Family Medicine. In addition to presenting dozens of keynotes and workshops across North America each year, Dr. Wolfelt facilitates 4-day training seminars for bereavement caregivers in Fort Collins. Dr. Wolfelt is a popular media resource who regularly provides his expertise to many top-tier television shows, newspapers, and magazines. He is the author of more than fifty bestselling books on grief and loss, including The Depression of Grief; Loving From the Outside in, Mourning From the Inside Out; Understanding Your Grief; The Journey Through Grief; Companioning the Bereaved: A Soulful Guide for Caregivers; Healing a Spouse’s Grieving Heart; Companioning the Grieving Child; Healing a Parent’s Grieving Heart; and Creating Meaningful Funeral Ceremonies. Dr. Wolfelt and his wife Susan, a family physician, are parents to three children. They live in the foothills of the beautiful Rocky Mountains next door to the Center for Loss and Life Transition. Baue Funeral Homes, Crematory, and Cemetery has been honoring lives for over 80 years. With three locations in St. Charles County, Baue is committed to providing the highest standards in quality, caring and sensitive service at the best value to each family it serves before, during and after death.